Two men allegedly responsible for both organizing and carrying out the killing are being held in Moscow. Federal Security Service (FSB) Director Alexander Bortnikov identified two suspects in the murder of opposition politician Boris Nemtsov on Russia’s Channel One TV on Saturday. "As a result of work that has been done, two men suspected in committing this crime were detained today. These men are named Anzor Kubashev and Zaur Dadayev. The head of state has been informed," Bortnikov said, adding that the investigation is not complete. "The necessary operational and investigative procedures are continuing," he said. The suspects will be charged in the crime, but probably not immediately. "Preliminary information suggests that a decision on the matter will not be made today. The necessary requests will be filed on Sunday or Monday," a source familiar with the situation told Interfax. The two men are suspected of both organizing and perpetrating the crime, Russian Investigative Committee spokesman Vladimir Markin told Interfax. 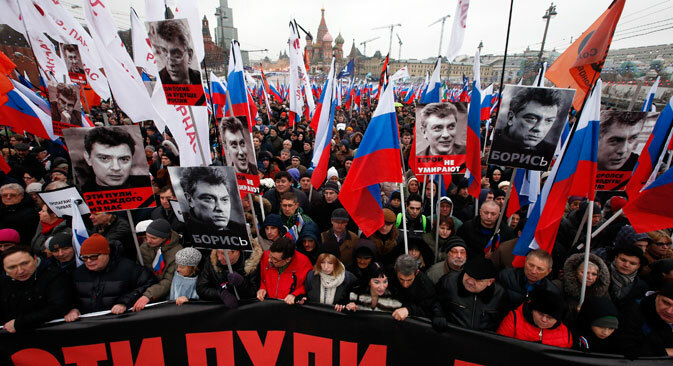 "We can confirm that the detainees are responsible for the organization and perpetration of Nemtsov's killing," Markin said. Because the case is being investigated by the Russian Investigative Committee's main investigations department, the request for arresting the suspects will be filed with Moscow's Basmanny Court. Anna Fadeyeva, the Basmanny Court press secretary told news agency Interfax that the court had not yet received any documents on the case. "I don't have any information," she said. Nemtsov was shot and killed while walking on the Bolshoi Moskvoretsky Bridge near the Kremlin at approximately 11:30 p.m. on Feb. 27. The Russian Investigative Committee is pursuing several possible motives in the murder. "At President Vladimir Putin's instructions, the FSB, the Interior Ministry, and the Investigative Committee have been tasked with setting up a joint operational and investigative team to investigate Boris Nemtsov's killing," Bortnikov said. "After the crime was committed, law enforcement agencies almost immediately had good clues to solve this case," a source close to law enforcement authorities told Interfax. “The car used by the alleged killers was found quite quickly, and biological materials found inside it helped trace them. "In addition, the law enforcement managed to obtain quite clear pictures of the evildoers after examining records from the street video cameras," the source said, adding that cell phone records were also used in the investigation. "However, it is too early to close the case. Those who organized and ordered the crime have yet to be found," the source said. Ilya Yashin, an opposition leader and associate of Nemtsov, said that he hopes the men actually played some role in the crime. "We hope those who have been detained really had some relation to the murder, and that this is not a mistake, but a result of the law enforcement agencies' good and efficient work. It's hard to judge so far whether it is so," Yashin told Interfax. In other news related to the murder investigation, Nemtsov’s lawyer Vadmi Prokhorov said that Ukrainian model Anna Duritskaya, who was walking with Nemtsov when he was killed, could be asked to return to Moscow to give testimony in the case. Duritskaya returned to Kiev several days after the murder, following initial questioning by police. "Yes, she may be summoned, but I am not in a position to say anything more here, as we don't have official information or summons yet," Prokhorov told Interfax. "Nothing is clear about how this is going to be done. She may be questioned at an airport," he said. Mikhail Fedotov, the head of Russia’s Human Rights Council, said that he expects law enforcement to identify and detain all people responsible for Nemtsov’s death, including those who ordered the crime. Certainly, it is important to find both those who committed and those who ordered this brazen and cynical crime. To this end, it is necessary to identify all those who played some role in the killing," Fedotov told Interfax.